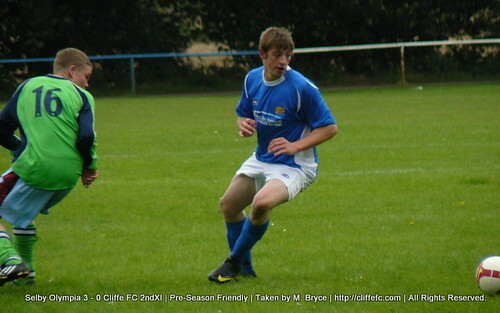 Cliffe FC’s second team faced Selby Olympia on Saturday afternoon and were unlucky to come away being beaten 3-0. Cliffe’s second team looked fired up for this pre-season friendly before kick-off and their performance showed this in the first half. Olympia did hit the bar from far out but Cliffe forwards, Aaron Lees and Nathan Horner looked a threat combined with wingers Tom Lonsdale and Tom Ellwood. Cliffe were worth the 0-0 scoreline at half time. The away side declared their intentions from the first kick of the half when Horner made the ‘keeper make a save when he shot straight from kick-off which the ‘keeper had to tip over the bar. Cliffe arguably were the better side when the first goal of the game was scored but it fell to Olympia and after a few changes for both sides Olympia scored a worthy second to go 2-0 ahead. Cliffe did carve out a few half-chances and continued at times to look the better side. Once again though Olympia scored shortly before the final whistle and made the final score 3-0. Cliffe’s Reserves should feel hard done by for this score, they at least deserved a goal but the performance as a whole was a vast improvement from the previous Reserve fixture.